If you hadn’t noticed yet, I love entertaining. It’s the perfect reason to try all the fun, yum, frilly things on my Pinterest boards and I get to make people feel special…or at least smile for a little while. 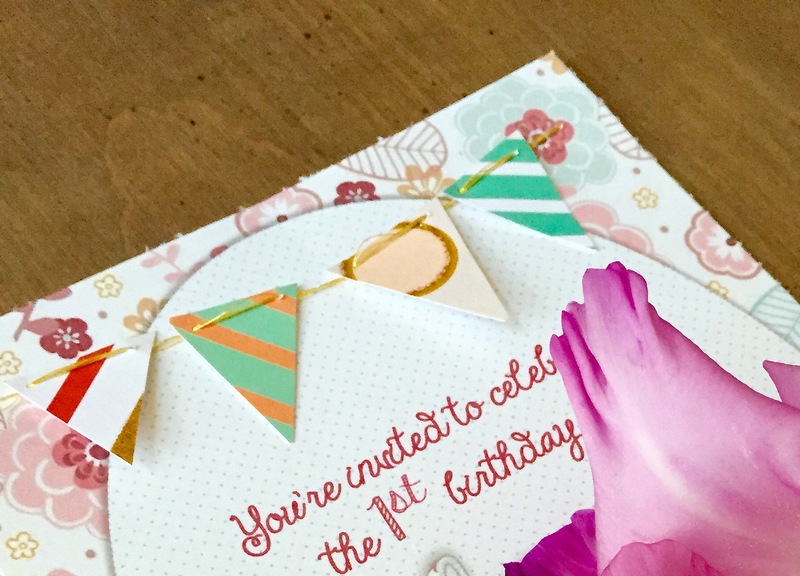 Now with a baby that’s turning ONE *cue tears* we have a major party coming up! On top of that, we decided to maximize our time with our out-of-towners and do her baptism the following day. Two big occasions, two invites…and a budget. This is when my favorite thing happens – I get creative! Let’s start with the baptism. This is a bit more of a formal event so I decided to use one of my favorite secret weapons – Michaels wedding aisle. If you’ve never gone down this aisle or haven’t since your wedding – DON’T EVER STOP. The bang you get for your invitation buck here is fantastic, especially when armed with one of your coupons (if you haven’t signed up for Michaels coupons do it now!). 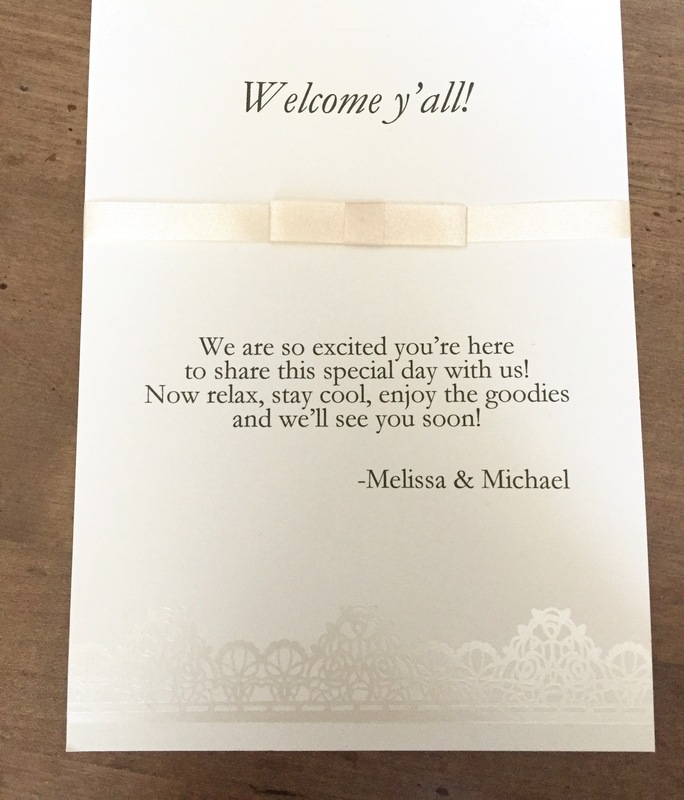 What you’ll want to look for are the invitation kits. I love the Gartner Studios ones. Here’s the one I chose – the gold stamped dots sold me! Let’s take a minute to marvel at these kits. First, look at how much you get!! 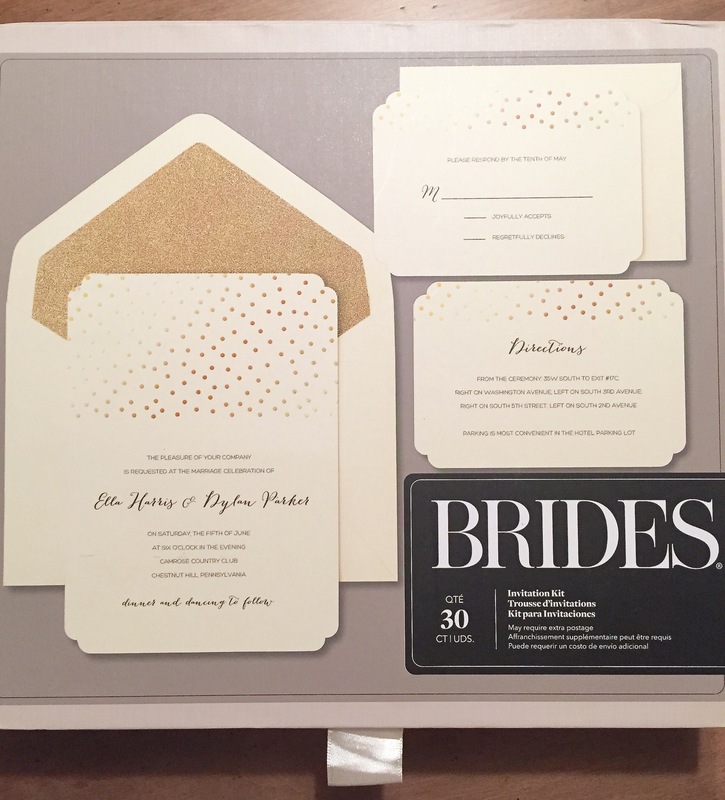 30 was the least count they had and each kit comes with envelopes, blank invitation cards, RSVP & envelope cards and comment cards (and sometimes little stickers!). That’s a ton of themed work already done for you! Your thank you cards, place cards, food cards, etc are all there! Second, the quality is great and way better than what you’ll generally find in the stationary aisle (for MUCH cheaper). Lastly, the price is fantastic! This was $40 regular price and I had a 50% off regular price item coupon making all of my goodies just $20. If you’ve ever purchased invites from online sources you know this is a good deal. Here’s my mood board for my baby girl’s birthday invitations. I loved the big circle detail & banner on one, how the smaller details like date and time were done in another and I loved the 3D effect of the star banner on the black invitation. So…I have my inspiration, time to get going! STEP 3: Use your fonts! In order to get the same effect of those professional invitations, you’ll want at least two-three fonts that work well together. My trick is to do a little Pinterest/Google search with something like “free font duets” or “free summer fonts.” People have already done the hard work for you! I always save these free downloaded fonts in a separate folder so I can easily navigate to them. You can find some of my favorite fonts here. As I mentioned earlier, I loved the 3D effect of the banner from the black invitation. All I did to create this little banner was take some metallic gold thread and some of my inspiration paper cut up some triangles and got to sewing! I love how they sort of dangle and shimmer. I also chose to print these on a shimmery paper to add a bit of glam. My final touch was to back them with another piece of the patterned paper – this covered my stitch marks and made them nice and thick. 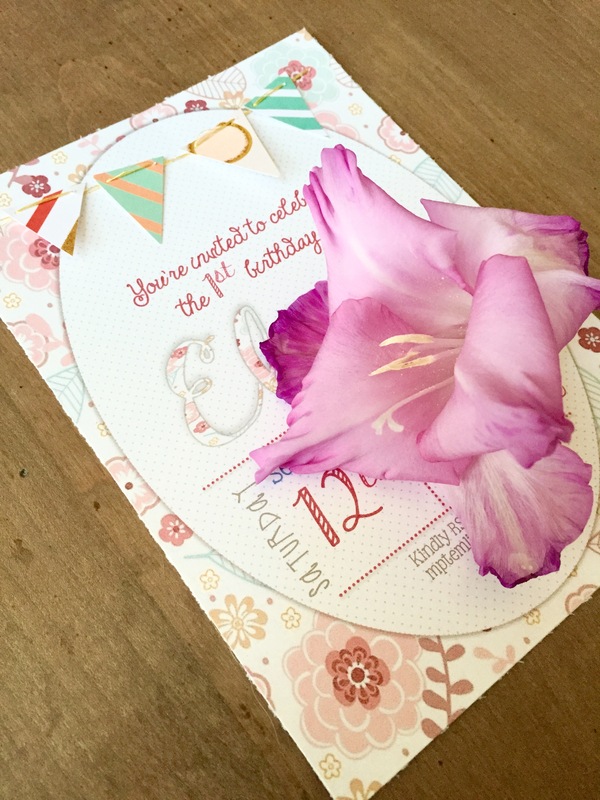 There you have one darn cute, customized birthday invite! Don’t have the time or patience to create your own? That’s totally cool, don’t stress! 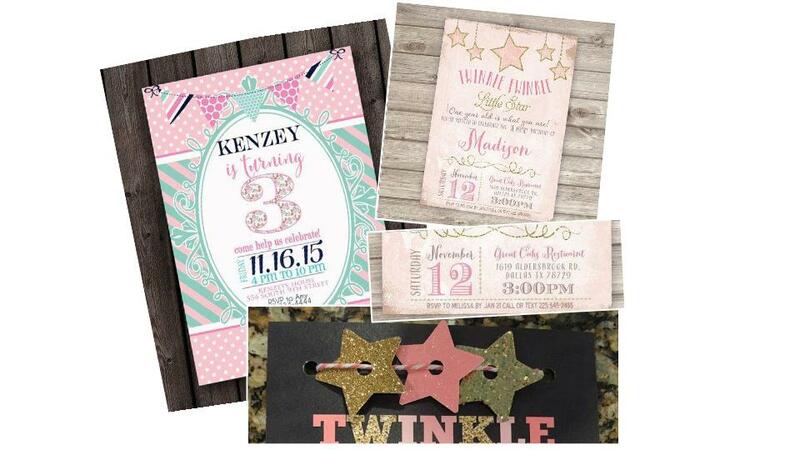 Find the perfect invitations online and add your own touch by sewing on a banner, adding a bow or gems. Here’s a secret: whenever you happen to pass by a craft store, stop in and see if there are stickers or gems on sale. You’ll quickly build up a library at very low-cost. 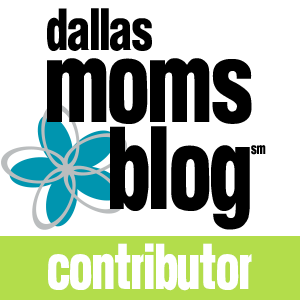 Hope this inspires, answers some questions and relieves some stress for your upcoming event! And got you a little excited to see all the party details. Stay tuned!